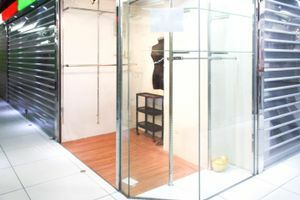 The shop is located on the 2nd floor of Chung King Express, a shopping mall right next to Chung King Mansion in Tsim Sha Tsui. It's about 60 square feet in size and a corner shop. Lots of small fashion-related businesses' owners (manicure, pedicure) often shop there. This cozy space is well-lit and ventilated. The monochrome design with white walls create a nice clean finish; it is equipped with lightings and shelves.